I was browsing the other day in Winnipeg’s only independent (non-used) bookstore, which is one of the few places left in town where you can still buy movies on disk. The department is small, but the selection is pleasingly eclectic. I don’t know who does their ordering, but there are almost always odd and unfamiliar titles on the shelf … the one drawback being that much of the stock is prohibitively over-priced. I’m ashamed to say that I’m in the habit of using my phone to check on-line when I come across something that interests me … and if I can find it much cheaper, I order a copy rather than buying in-store. But I also want to encourage them to keep bringing in interesting titles, so if the price differential is five dollars or less, I will buy it then and there (the little bit extra is worth it because I still prefer to walk home with the disk in my hand, rather than have to wait weeks for it to show up in my mailbox). On this particular trip, thanks to a staff member who had decided to give it prominence on the wall display, I came across a DVD with a striking cover (a demonic-looking man with six arms, a woman gripped in each hand, against a fiery background). Beyond the image, the title was intriguing: Trapped By the Mormons. This turned out to be a 2006 release (from a company I’d never heard of called Grapevine Video) of a British silent feature from 1922. This obscure movie was produced by a company called Master Films, directed by the company’s general manager Harry B. Parkinson, and based on a 1911 novel by a prolific writer named Winifred Graham, adapted by the also prolific Frank Miller (131 credits in twenty-three years). While Trapped By the Mormons is included in the extensive filmography in the book, Low has nothing to say about this film specifically, although her general description does apply. Absurd, yes, melodramatic certainly … not to mention wacky in its determination to warn the British public of the insidious threat posed by Mormon missionaries in their midst. Oddly, the film suggests both that these foreign cultists are frauds who deceive by trickery and that they possess some genuine mystic power. The very first image introduces us to Isoldi Keene (Louis Willoughby), a Mormon with mesmeric powers who has already set his sights on middle-class Manchester girl Nora Prescott (Evelyn Brent). 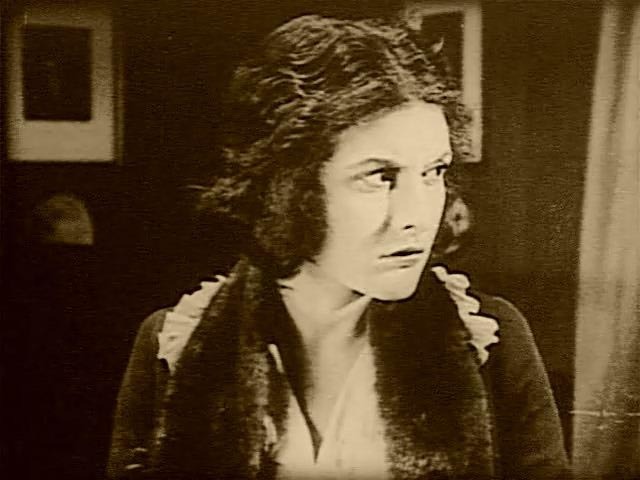 Although Nora is engaged to a sailor (currently away at sea), Isoldi approaches her one morning on her way to work and uses his hypnotic stare (very similar to Lugosi’s nine years later in Dracula) to disarm her. His plan – apparently part of an organized Mormon plot – is to lure her away to become yet one more innocent enslaved in the sect’s harems back in Utah. Isoldi consolidates his power over her by staging a phony resurrection-from-the-dead – which for added disreputability takes place in a Gypsy caravan. 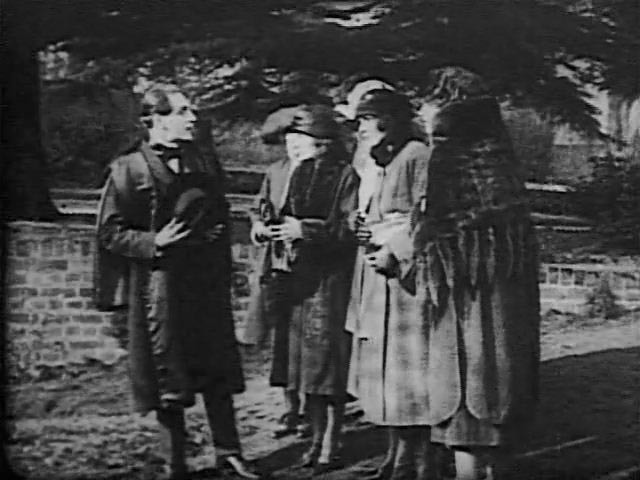 Despite the furious opposition of her crippled father, Nora ditches her fiance Jim (George Wynn), who has just returned from sea, and leaves with the sinister foreigner. Jim engages a detective and goes in pursuit, waiting for an opportunity to rescue her. At the house where the Mormon elders plot their evil schemes, Isoldi’s strangely jealous “sister” Sadie (Olive Sloane) reveals that she is actually Isoldi’s first wife, and she resents his having chosen Nora to become her co-spouse. Trouble between the two women causes the Elders to decide to murder Sadie (making it look like suicide) and then when Isoldi is away, they decide it would be best for everyone if they kill Nora as well. Just as things look their darkest, Jim and the detective arrive with a squad of policemen, a big fistfight ensues and the two women are saved, with Nora finally wise to the evil of the cult which tried to ensnare her. 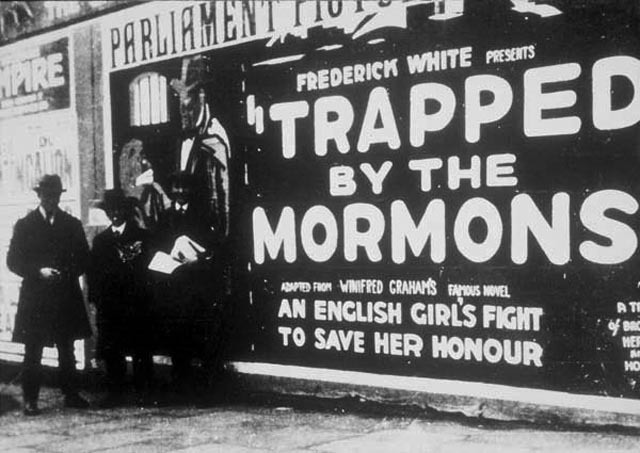 Needless to say, the film offers little in the way of plausible information about just exactly what Mormonism is, and yet it was apparently part of a campaign against the religion in post-war England, where people feared that widows and single women were being targeted for those harems back in Salt Lake City. Perhaps the most surprising thing about the film, beyond its absurdity, is the presence of Evelyn Brent in the lead role. She even followed it up the same year with the lead in Married to a Mormon, another anti-Mormon movie, also directed by Parkinson. Born in Tampa, Florida, she had a long career in silent film which peaked with roles in Josef von Sternberg’s Underworld (1927) and The Last Command (1928). She was equally prolific in the sound era, although she mostly appeared in B-movies and program pictures (most notably Val Lewton’s The Seventh Victim in 1943, which she immediately followed with a Bowery Boys pic). This piece of clumsy propaganda might have vanished completely if not, strangely, for the interest of Mormons themselves. The DVD features a number of supplements, including interviews with Chris Hicks and Sean Means, both of whom are Mormon journalists, and James D’Arc, curator of the Brigham Young University Motion Picture Archive, in which they mention that it’s seen as something like the Mormon Reefer Madness, appreciated at screenings as a ridiculous, inadvertent comedy. D’Arc also contributes a commentary track in which he discusses the anti-Mormon campaign which inspired the film, the background of author Winifred Graham, and the misconceptions about Mormonism which abound in the novel and the film. Altogether, the disk illuminates a peculiar, previously unknown (to me) niche in English social history. Also included on the disk are a brief Edison short from 1905, A Trip to Salt Lake City, which seems to be the first on-screen reference to Mormons, and a featurette on the recording of the organ score by Blaine Gale on a beautifully restored Wurlitzer in Peery’s Egyptian Theater in Ogden, Utah. Finally, the disk includes Winifred Graham’s original novel, although inexplicably this is presented as on-screen text rather than a downloadable PDF, making it essentially unreadable. 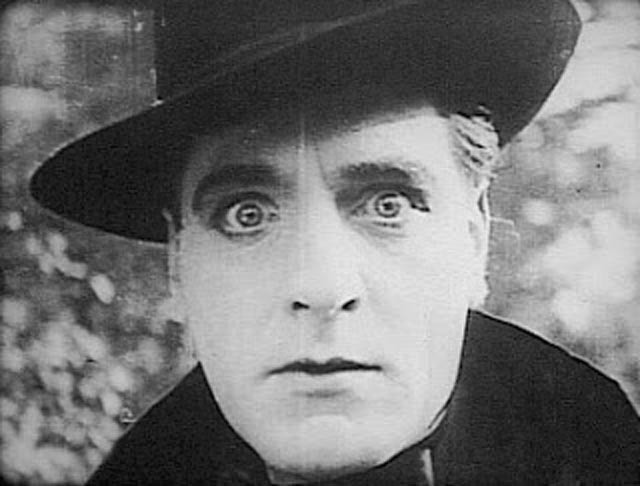 This entry was posted in Review and tagged British Film, Religious Films, Silent Film. Bookmark the permalink. I had no idea that the Mormons were so prosecuted but hardly anyone likes them coming to their door so it’s not too surprising. I remember when they came to John Henderson Jr High, East Kildonan, and I made the mistake of letting them come visit my house. I was sorry before there and my mother said you invited them, you deal with them. I made the couple of young guys that came over watch the last half of Space 1999 before they could pitch me some religion. They went home without a recruit. When I went to the University of Winnipeg in the late ’70s, I lived in a rooming house on Notre Dame and the downstairs was always occupied by pairs of Mormon missionaries. You never saw them without immaculate suits, blindingly white shirts and ties. Every day they’d set out with briefcases, no doubt filled with religious pamphlets … and I don’t recall them ever saying a word to me. Maybe they had instructions not to bother the other residents … or maybe I looked irredeemable! Fun to find your interesting review as my brother and I produced this particular disc for Grapevine release. You did a nice job of reviewing it. I wish that we’d thought of making the novel available as a pdf file. The book is quite rare and a fascinating read. You mention Chris Hicks and Sean Means as being Mormon Journalist (which they are). Hicks is a member of The Church of Jesus Christ of Latter-day Saints but Sean Means is not. Both were more than willing to appear in our documentary and speak about the influence of the film. Thanks for your thoughtful piece. Thank you for producing the disk. One of the great pleasures of DVD and Blu-ray is the discovery of obscure movies like this, which regardless of their intrinsic qualities as art and/or entertainment, help to expand our knowledge of film history – and the history of the times in which they were made. I really appreciate the effort you put into this release.